Boyfriend jeans is one fashion trend that effortlessly blurs the line between classy and funky. Boyfriend jeans is one fashion trend that effortlessly blur the lines between classy and funky. A far cry from conventional skinny jeans, these jeans are versatile and can look ultra glamorous with almost everything- from a cool tee, to a shirt, to even a sharp blazer! So, join the fashion bandwagon now. Basically cool: Is there anything a plain white-tee cannot fix? When in a dilemma over how to style your boyfriend jeans, it can't get simpler than the white tee! A white t-shirt and boyfriend jeans are now considered a classic, and the powerful duo promise no room for failure! Just reach for these two when you're running late in the morning. Class up the act further in a pair of comfy pumps. Earn your stripes: The denim and stripe combination always works. For a striped ensemble that's aesthetically pleasing, a rugged pair of boyfriend jeans for women does the trick. Whether it's a t-shirt or a shirt, those nautical stripes always manage to rub off its classy streak, and your BF jeans are no exception! Heading to a brunch or just another casual Friday? Put on some red lipstick for an instant pop of colour and wield out those tan accessories for a finishing touch. Match perfect with double denim: The double denim trend is here to stay! 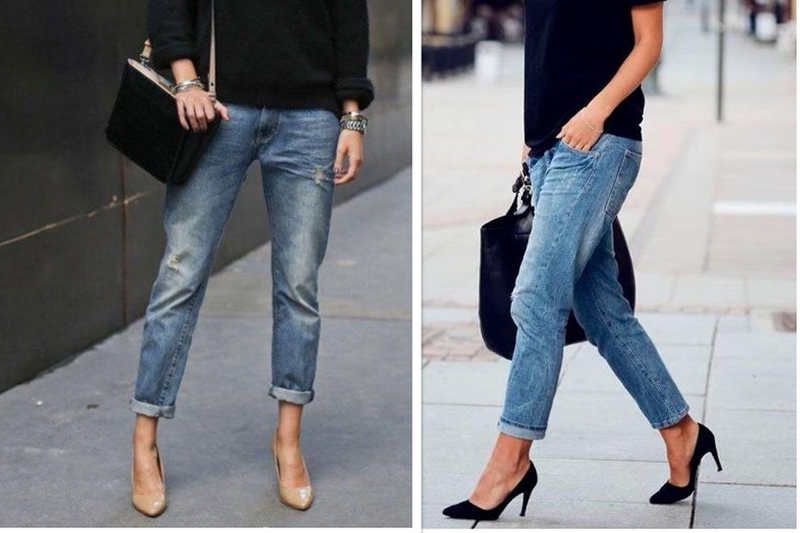 And, with boyfriend jeans for women, the cool quotient only goes up several notches. There are opportunities galore when it comes to experimenting with this look. A bold black tee, a baseball cap, white sneakers, or bold red lipstick, rope in a statement element to match up to your statement look! The good crop: Boyfriend jeans for women can look beautifully feminine and chic too. Trust the dainty crop top to work wonders. And this look can go two ways! Give it a cheerful vibe with colourful oxfords or leave it up to a pair of stilettos and a clutch for that extra touch of refinement. It gets better with a blazer: Blazers; the epitome of formal dressing and elegance. But how well will the poised blazer go with the carefree, baggy boyfriend jeans for girls? Turns out the combination is a hit! Try it out at office and get a nod of approval for your out-of-the-box fashion sense!